The STO Academy is one of the largest and most popular fleets in Star Trek Online and was founded February 2010. We have over 450 members across our Armada so you are guaranteed to learn about the game, make new friends, and have a great time. Promotions within the fleet are based on Fleet Commendations. There's a wide variety of them so you can earn a promotion however you want. We're made up of five fleets. In addition, other fleets throughout Star Trek Online have joined our Armada. We are a casual social fleet and our goal is to have fun together whilst playing this great game. What we can offer you is fun social interaction with regular events, fully stocked fleet banks and weekly giveaways. We have a large number of active experienced players capable of playing all aspects of the game and able to offer advice to new Captains in Star Trek. We have an excellent website full of useful information guides and a very comprehensive Skill Planner, as well as a forum where you can ask the fleet for advice or just chill. If you are a player and would like to join us or try us out, please follow this link to our recruitment page. The STO Academy has a bunch of events this weekend and we'd love to have you there with us! Join now to participate. Check out our events page for a full list of what's coming up! Check out some of the fleet's fan fiction. We have more in our private section on the forums. All members are welcome to write and share their stories! Not sure if you want to join? Check out the fleet gallery. It has pictures from our events and some inside jokes. I hope you enjoy it, we certainly did! Is the STO Acadamy Fleet also represented on consoles? No, sorry. We're a PC only fleet. The STO Academy's very own flagship, the U.S.S. Fortitude, needs helping defending the galaxy. Join today! We have some fun events coming up this weekend. Join now to take part. I highly recommend the build clinic. Even if you can't make it, we make audio recordings of it so you can listen later! STO Academy is looking for anyone willing to defend the galaxy! Join us today. Our new and improved events page is up! Now if only we can find some more members to join in the fun! Age of Discovery is on its way to STO! Join the STO Academy now in preparation for it. We'd love to fly with you during this new expansion! The STO Academy has some great events coming up. Join now to take part in the fun! The STO Academy is always looking for new members. We don't just play STO, we're an active community with a variety of activities. Interested in fan fiction? Our members write and share their stories for everyone to read! Want to discuss Star Trek, science fiction, or some crazy bit of news you heard? Feel free to share it on our forums! Why join the STO Academy over other fleets? We're home to the Skill Planner. Using the planner is a great way to get advice about your builds or share something awesome you've discovered. Our forum has a special section just to share builds. Join the STO Academy today and have some of the best players help you with your build! What are you doing this weekend? I hope it's joining the STO Academy for some fun! Explorers! Warriors! Survivors! Soldiers! These make up the STO Academy! All are welcome! Join today! The STO Academy is looking for new recruits to join our ranks. Learn about STO, participate in countless events, win prizes, and so much more. The STO Academy has been around since 2010 and has been one of the most active and important communities in STO, and we'd love to have you as a part of it! We want you... to have fun! Join the STO Academy today and take part in some of our fun events this weekend, including our monthly meeting on Sunday. We look forward to having you! Do you write fan fiction? Create art? Enjoy sharing content with a community? Join the STO Academy. We're more than a fleet that plays STO. We encourage all members to share and cultivate their talents! Age of Discovery is being released today! If you're looking for a group of players to play the new content with and earn marks for Tier 6 reputations then look no further! The STO Academy is here with a large group of members! I hope you are enjoying Age of Discovery and are looking forward to the upcoming stories that will be told during this arc. 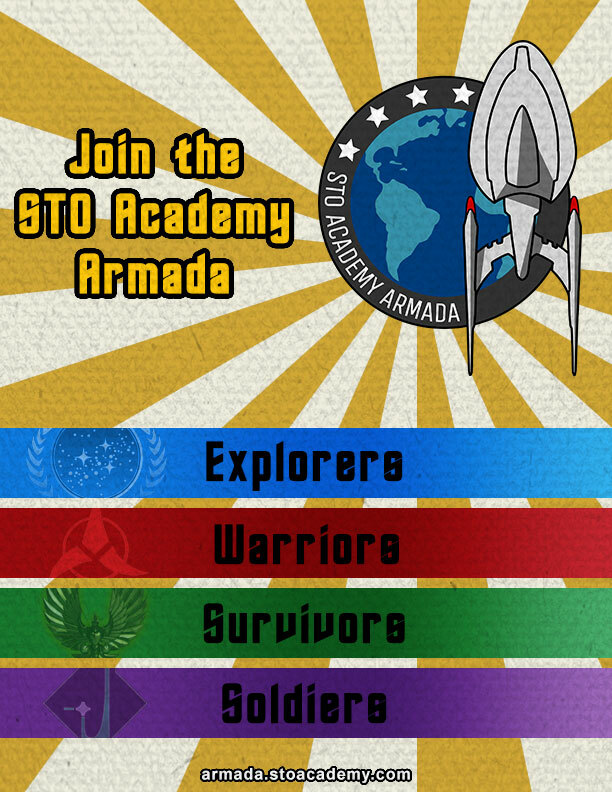 If you're looking for friends to play with, join the STO Academy. Everyone is welcome! The STO Academy is looking to expand its ranks. As a member you get access to all our holdings, fleet specific equipment/ships, the knowledge of some of the best players in game, tons of weekly activities, and the change to meet some new friends. Join us for a great experience! Rules of Acquisition #9 "Opportunity plus instinct equals profit." Does your instinct say to join the STO Academy? I hope so, you'll profit in more ways than one! Has my attempt at appealing to your inner Ferengi worked? Looking for a fleet? The STO Academy is one of the oldest and most well-respected fleets in game. Join today and become part of our family. Hope everyone is having a good week so far! Join the STO Academy to make your week so much better. The Arena of Sompek is coming back (again). Hopefully the bugs have been squashed! If you're looking for a group of people to play with, join the STO Academy now. The STO Academy has been around for 8 years and in that time I've met some really amazing people. I'm looking forward to meeting many many more over the coming years. Join now and say hi! How long have you been playing STO? A day? A week? A month? A year? We welcome all players, new and old. Priority one message to all Captains. The Milky Way galaxy is under constant siege by random enemies. We need to come together under the banner of the STO Academy fleet to defend our home and way of life! Join us and fight!